4-weeks-menu-4th-feb-1551698944.pdfEvery day at Ealing Fields starts and ends with a period of silence which helps students cultivate a habit of reflectiveness. The spiritual routines used in morning tutor times and assemblies are in common with Twyford and William Perkin and are designed to give every individual, irrespective of their own faith background or culture, space to centre themselves and therefore engage fully with the community life of the school. The formal framework for this routine is drawn from the Christian tradition and this gives shape to the core values of the school. The PSHE programme within the school is also values driven and encourages students to develop a strong sense of social responsibility inspired by the examples of inspiring stories of individuals from world history and current affairs. In the upper school the programme also supports students to reflect on the development of interpersonal and employability skills as well as providing careers guidance and IAG. The pastoral programme also uses a framework of Bible stories which give students an understanding of the narratives which have informed British culture and RE/Ethics is a compulsory subject which is used to teach critical thinking & problem solving as part of the afternoon extension offer. s a small school, Ealing Fields aims to be an environment with a family feel. Students in Years 7 & 8 have formal sit-down meals together at lunch time and quickly learn the courtesies of laying the table, serving each other and waiting for others to finish eating before the next course is served. This is a compulsory part of the school day and as important as lessons or after school activities. It is therefore essential that Ealing Fields students adopt positive behaviours and quickly recognise if their behaviour is having a negative impact on others. All students will eat a meal that has been freshly prepared on site by our caterers, as part of the Family Dining experience, there is no option for packed lunches. From 2017/18, payment for school meals is via ParentPay. Our lunch menu changes every day, click the link to see the latest menu. We are currently on week 1 Halal meat is provided. 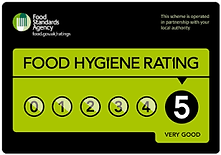 On 27th March 2017 Ealing Fields High School kitchen received the top rating of 5 = very good from Ealing Council's Food Regulatory Services Officer the rating certificate is shown below. Ealing Council has signed up to a new national food hygiene ratings scheme (in partnership with the Food Standards Agency). The scheme will give information about the hygiene standards in establishments where food is served. Please click for further information. Ealing Fields encourages the spirit of courageous endeavour which supports effective learning and strong habits of leadership in its learners. Students are encouraged not to be afraid to take calculated risks in their learning as the most profound progress often requires us to work outside our comfort zones. At Ealing Fields, we aim to foster a culture where we will encourage our students to experiment and try - in the spirit of growth, and embrace failures as the preparation for future successes. An essential element of this process is a commitment to feedback and self-evaluation for students, staff and the wider school community to embrace it as a powerful strategy for learning and improvement. It is this confident approach to building students’ capacity to develop as learners which aligns most closely to the values of the Twyford Trust. In all Trust schools students are introduced to a balanced and aspirational set of disciplines referred to as the 10:10 ethic. Using these approaches all students are encouraged to see themselves as having good gifts which they are to develop not simply for themselves but also for the benefit of others within the community. Students are supported to be honestly self- evaluative – recognising their gifts but also being able to acknowledge weaknesses without negativity but with a commitment to self-improvement. Within this strong communal ethos, students become resilient to overcome difficulties and highly aspirational to meet personal goals. We welcome applications from families who are keen to embrace this energetic culture of challenge and self-improvement – within a prestigious family of highly successful schools. To foster a sense of community and competition, Ealing Fields has a House System. The houses are named after well-known citizens from Ealing, who have all made positive contributions to the disciplines within the Ealing Fields Curriculum Strands. Each tutor group belongs to one of four houses. The houses will provide a broader source of identity for students, and inter-house competitions will fuel a friendly rivalry that leads each year to the awarding of the house trophy. The trophy will be competed for through points gained for a wide range of performance indicators and enrichment activities. A formal system of positive conduct points is used to reward positive conduct and students are encouraged to take a pride in the cumulative points which are collected by each tutor group and house as well as each individual. Negative conduct is picked up equally quickly and a same day detention system operates so that students immediately reflect on their mistake and are ready to move on from it. Undoubtedly this makes Ealing Fields a strict school – but also one which cultivates self- discipline and mutual responsibility.